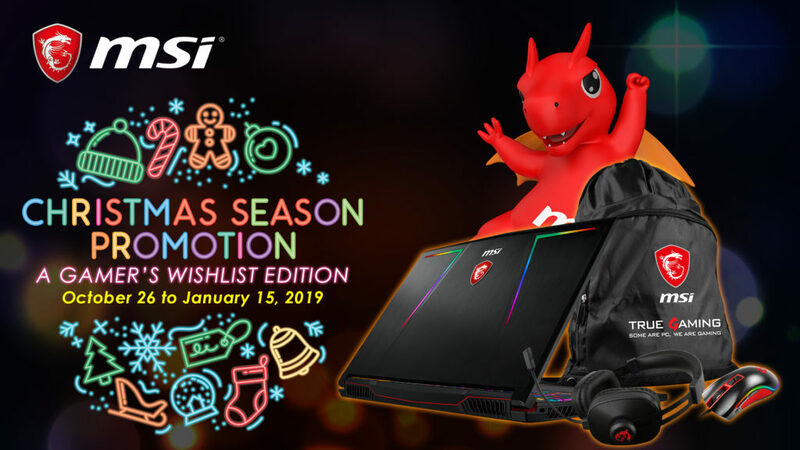 MSI, a world leader in the gaming hardware, will be starting their Christmas promotion for their gaming laptops early. The promotion will start this October 26 and will end on the 15th of January next year. For this year’s theme, MSI focused on every gamer’s wish: a gaming laptop for their specific needs. In time for the season, MSI has given every gamer or every game enthusiast a chance to pick which MSI gaming laptop suits his need at a very reasonable price. Not to mention the additional freebies bundled on select models. Undoubtedly, it is a gamer’s dream to own the best gaming laptop that is perfect for his liking. 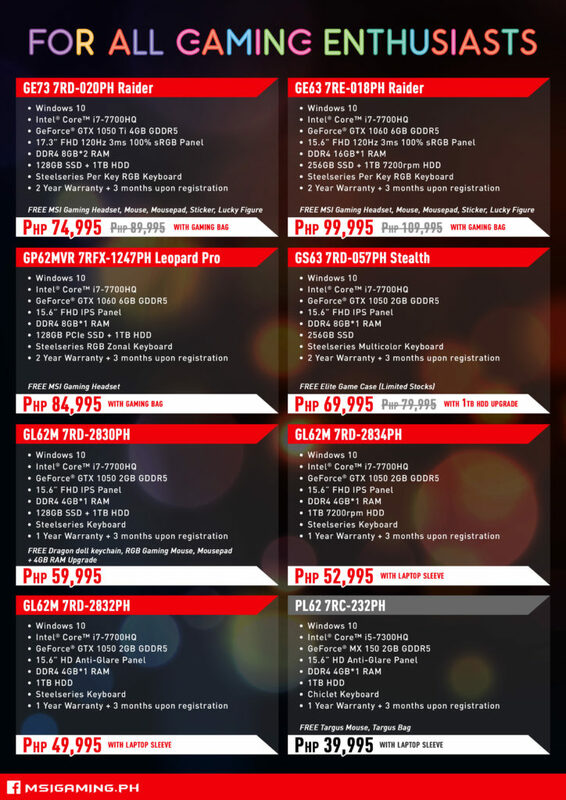 And with MSI’s Christmas promotion, choosing your very own MSI gaming laptop will no longer be that hard. 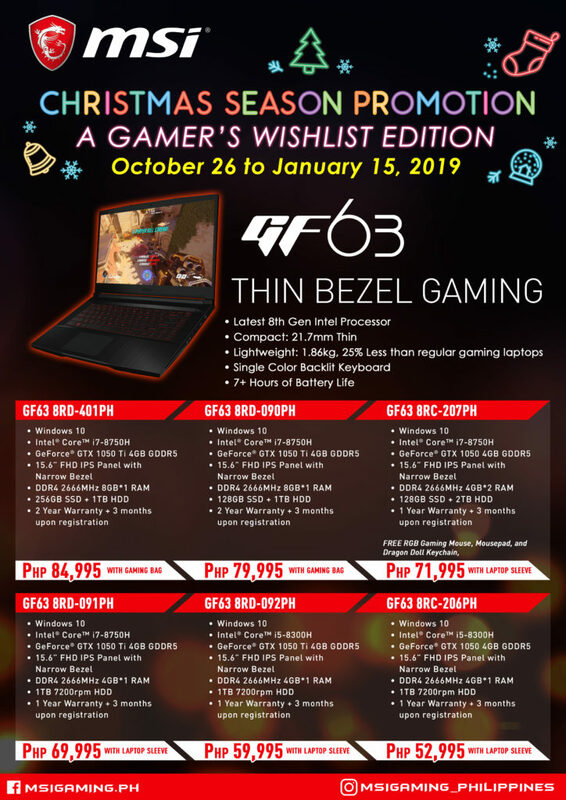 If you are looking for a gaming laptop where you can play e-sports or high-spec games but on a strict budget then the MSI GF Series is for you. It is designed for individuals on a strict budget without compromising the specs needed for your favorite e-sports games. The GF Series has a starting price of P52,995. It already comes with an Intel® Core 8th Gen processor, a graphics card of Geforce® GTX 1050 or 1050 Ti and a 15.6” FHD IPS Panel with Narrow Bezel. While if budget is not a concern, but you opt for better specs and better gaming experience, then the higher series of MSI gaming laptops is for you. If you want to be an eye-catcher, or want something fancy yet delivers the best gaming experience, MSI GE Raider RGB series suit you best. Still cannot make up your mind? No worries! MSI still has a long list of gaming laptops to offer that will perfectly fit your gaming needs. Below is the list of MSI gaming laptops with Intel® Core 8th Gen and 7th Gen processors to choose from. Who says MSI cannot be more sophisticated? 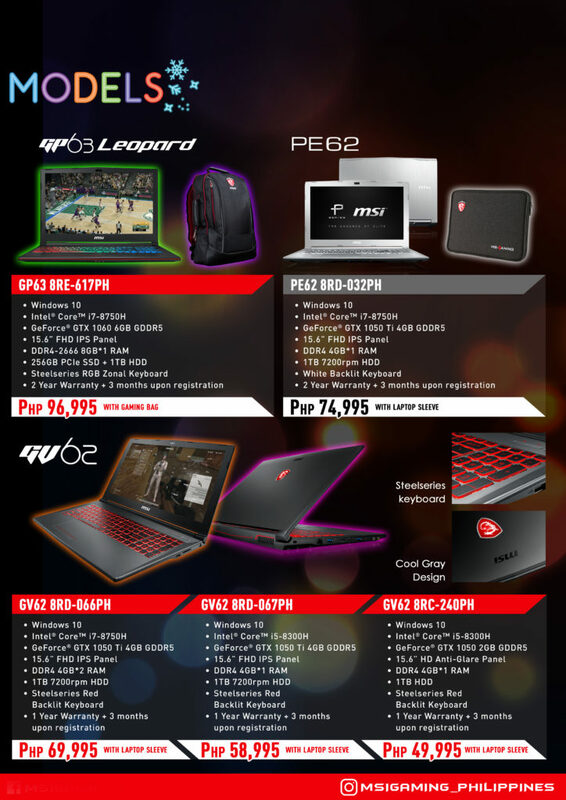 Before ending the year, MSI Philippines has announced its newest series that caters more on the chic, stylish and more reserved individuals. Yup. You heard it right. Aside from being known as one of the leading brands in the gaming industry, MSI has also started to reach out to individuals with a different passion other than gaming. 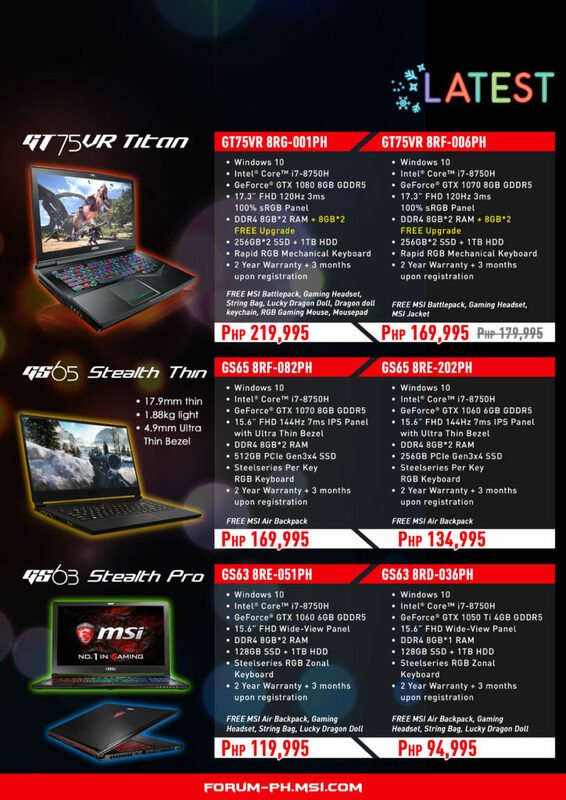 This shows the versatility of MSI and its message that MSI laptops can deliver to every individual’s needs. The new laptop model, known as the Prestige Series, caters to individuals part of the workforce, those who are behind every great works, on-the-go, and possess creative minds. 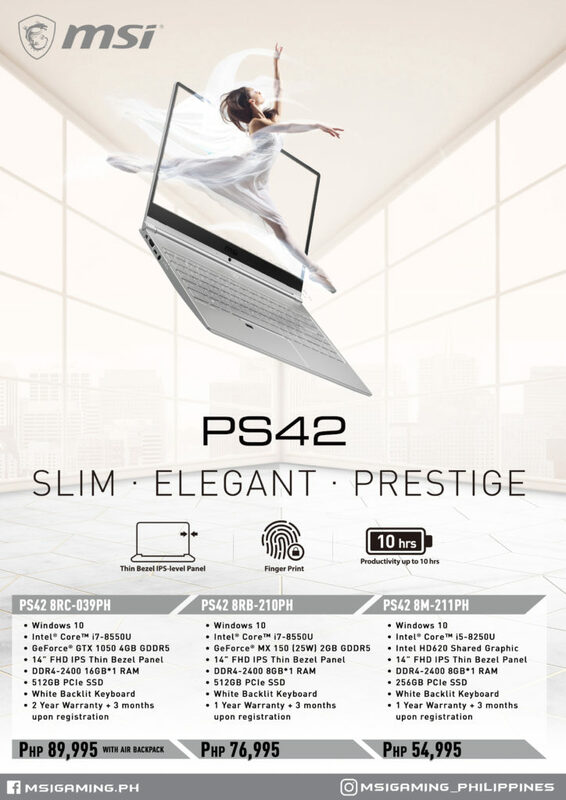 As embodiment of the description of its market, the Prestige Series proud itself with its Thin Bezel, light-weight design polished with a hair-brushed aluminum built. The aesthetics are perfectly designed for such individuals who are always on the go and reflects their personality of sophistication and elegance. But don’t be fooled by its looks. Because not only does it look good but it also delivers. The Prestige Series comes with the latest Intel® Core 8th Gen processor, graphics card and a 14” FHD IPS Thin Bezel Panel. What’s more? If you buy the PS42 8RB-210PH, you can get a free Intel Creator Software Pack worth USD400+.